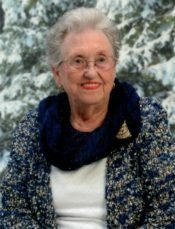 Margaret Ann Mills Green Mouser, 84 of Lillian, Alabama passed away on Sunday, January 20, 2019. Margaret was born in Floyd County, Georgia on September 19,1934 and moved to Greenville, Alabama at 16 years old. Living with Doris, she met and married Pete on June 14, 1953 moving to Pensacola, Florida to start a new job at Chemstrand. She held jobs as a caregiver for the elderly and a nanny to several children after serving as a church secretary for 25 years. After Pete’s death, she moved to Lillian, Alabama to live with Pam until she married Hursel on April 22, 2003, gaining a son, Bob (Judy), they were married 12 years. She was a Godly woman all her life she loved big, always a smile or kind word when you needed it. She will be greatly missed by all who knew her. She is in Heaven with our Lord and Savior and enjoying the greatest Family Reunion EVER! She is preceded in death by both husbands, Pete and Hursel; her parents, Sidney and Roxie; siblings, Ralph, Doris, Sidney, John, Joe and Billy. She is survived by sister, Emma (Don); In Laws, Russell (Maxine), Shirley, Danny (Becky); children, Pam (Joe), Diane (Hank), Phillip (Trisha), Bob (Judy); grandchildren, Adam (Leslie), Julie, Sidney, Hank (Christine), Theresa, Wendy, Tabby, David, Kendral, Phillip, Catrina, Erica; great-grands, AJ, Morgan, Preston, Leila, Corbin, Hayden, Christian, Tory, Kaylee, Iris, Shelby, and Adrian. A visitation will be held at Pensacola Memorial Gardens Funeral Home on Friday, January 25, 2019 from 9:30 AM until the service begins at 10:30 AM. Honorary Pallbearer will be Martha Johnson. Pallbearers will be Phillip, Shelby, AJ and Kendral.